1 and 2 Written by 808state and M. Doughty. 3 Written by 808state. Produced by 808state. Licensed by Gema. 1 Engineered by Al Fish and Danny Radar. Mixed by AI Stone for SSO Wool Hall Studios, Bath and Olympic Studios, London. Recorded @ Baby Monster, NYC and @ Fon Studios, Sheffield. M. Doughty appears courtesy of Slash Records. 2 Remixed by 808state and Jim Abiss @ Bunk Junk & Genius, London. 3 Engineered by Aldan Love. Mixed by Al Stone @ Olympic Studios, London. Designed by Zang Tuum Tumb and M@ Maitland. As the smoke clears...three figures approach bearing tunes of great importance. Lot TheState of 808. 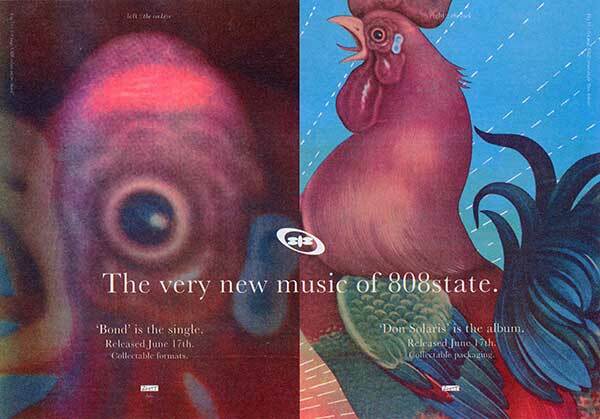 Featuring the mighty vocals of Soul Coughing's Doughty (who also co-wrote the track), "Bond" is the first taster of 808 State's new material and is released to coincide with their forthcoming new album, 'Don Solaris' - out on June 17th. Mad, bad and righteously spanking "Bond" is backed with an alternative version - "Bonded" - and a dreamy, creamy non-Lp bonus track "Chisler". 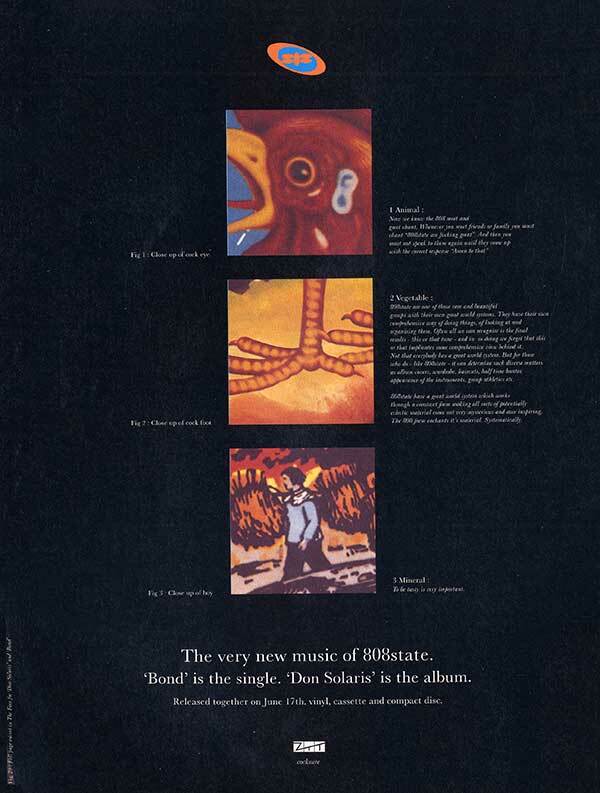 All tracks were written and produced by 808 State. awesome coupling of a funky double-bass and a sublime warped disco beat. The muted synth lines and vocal hook seep into the mix but before you have time to catch your breath 808 wrap their exquisite melodies around a massive breakbeat which runs its fevered course before letting the easy double bass take over once more for a very comfortable landing. 808 State take on the remix duties themselves on the flip and turn in a breakbeat funk-fest completing an essential package. Thanks for all your support on The Federation "Nocturne EP" (still not released until the 10th of June - so keep hammering the blighter). Good to see the latest Ruby single going well - the Grantby mix is outstanding! All of you lucky enough to receive the first release on All Good Vinyl - DJ Pulse "Destiny" are finding it works extremely well - great radio support and an essential tune on the 'Logical Progression Tour', if you didn't get one of the 50 we mailed do yourself a favour and buy one (released 20.5.96). The excellent UNKLE mixes of Folk Implosion have been put back a week (the release date now being 20.5.96) so if .you're playing this keep on it. Some of you have had a hard time getting you're heads around this release but it really is a grower (honest Guy) so give it an other spin and let us know what you think! This also seems to be the case for the new 808 State material. They could have easily gone down the "Let's do a commercial house tune" route but they have come up with something genuinely interesting and different. Maybe give "The Chisler" and "Bonded" another listen - they deserve your support! Interspin has been getting some great radio support inc. Tim Lennox (on the 'Essential Selection) and Matt Thompson and fellow cohorts at Kiss 102 - if you have overlooked this do yourself a favour and listen to all three tracks as they are all excellent! Well this is the start of a regular type news thang so tell us what you think, any suggestions will be greatly received! Cheers! Written by 808state and M. Doughty. Engineered by Al Fish and Danny Kadar. Mixed by Al Stone for SSO @ Wool Hall Studios, Bath and Olympic Studios, London.